The strongest of the Meganula species will pupate into a giant Meganulon. Rather than be on the offensive like its smaller kin, this giant version of the ancient insect will remain stationary. It relies on the smaller, drone Meganula to steal enough energy to power the creature for its metamorphosis. During the Meganula attack on Japan, the giant Meganulon made base in a submerged Tokyo. The mammoth insect stayed at the bottom of the water, hidden, as its brood attacked above the surface. 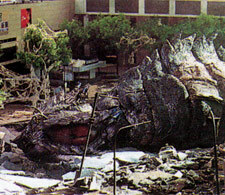 The smaller Meganula performed well, locating and attacking Godzilla. Sapping energy from an almost limitless source, the Meganula fled with the energy they stole. Depositing it into the giant Meganulon, the smaller insects gave their life to power the queen of the hive. Rather than transform into a giant Meganula, though, something else occurred. The husk of the beast was discarded as a new creature was born. Gone were its pincer mouth, replaced with a jagged series of teeth. 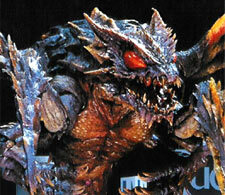 By using Godzilla as the source, the smaller Meganula gave birth to a mutated version of their species. A flying killer who now threatened all of Japan. Rose tinted eyes peered into the black depths of the blanketing waters of Tokyo. A maw, laced with dagger teeth, roared into the seas. Roped muscles struggled their bulbous weight from the shedded exoskeleton shell. The birth of a new demon was to lay against the frailty of man's mind. Wide eyes watched as the surface of the glossy river exploded. Rising from the showering droplets of rain the mammoth queen, Megaguirus, showed itself. Immediately the insect god began its destructive rampage. Flapping its leathery wings at blinding speeds, the monster dashed through the city. Buildings crumbled, and windows crashed. The wake of death widened against the raven wings of the bug. After leveling what reviled it's statue, the creature left the heart of the city, and traveled to the waterfront. Days passed before the inevitable war of Megaguirus and Godzilla waged. The aerial combatant threatened the ground-based reptile with defeat on several occasions. The incredible speed and energy draining tail, wearied on the King's defenses. Quick strikes, and hurling plasma energy, toppled the Japanese nemesis like a ton of bricks. Only through sheer luck of catching the insect's stinger in his toothy jaw, did Godzilla regain the upper hand. Time flashed by, as he tore away the syringe like appendage. Agony raced through the creature's form, temporally stunning the monster in mortal defect. Taking advantage of the break, the dorsal plated Godzilla fired his ember flame. The blaze engulfed the queen in a wall of fire. Characterless eyes gazed unfazed before finally the flaming carcass of Megaguirus crashed into the earth. Signaling the end of an ancient killer.